Looking for serious storage speeds for your photos, videos and files? 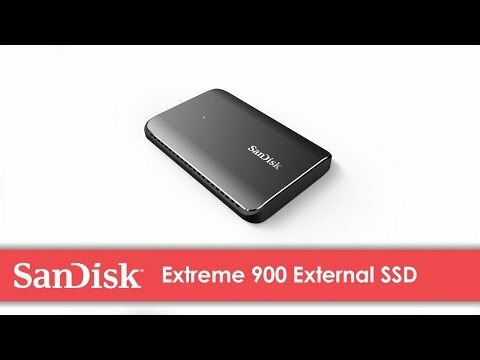 The SanDisk Extreme 900 portable SSD delivers up to 9x faster speeds than a portable hard drive2 in up to 1.92TB1 capacities to move your massive files in seconds. Working directly on the drive is more efficient too with faster access times. With solid state technology, there are no moving parts to break or overheat. SanDisk SecureAccess™ encryption software keeps your files private3. When your livelihood depends on it, trust the brand professionals rely on with SanDisk Extreme 900 portable SSD. Time is money. With up to 9x faster transfer speeds than an external hard drive and twice the speed of other SSDs2, the SanDisk Extreme 900 portable SSD dramatically reduces wait times, accelerating your work flow, putting your focus back on working, not waiting. Whether you’re filming and editing 4K Ultra HD video4, taking detailed high-res photos or creating large graphics files, with capacities up to 1.92TB1, the SanDisk Extreme 900 portable SSD can easily accommodate your content, no matter how big the files. Don’t let the sleek aluminum exterior fool you. The SanDisk Extreme 900 portable SSD is both temperature and impact-resistant5, so it’s ready for highs, lows, and even the occasional knocking blow. And any other eyes that you grant access to. The SanDisk Extreme 900 portable SSD offers encryption3 to secure your files so you can be sure that no one has access to your content unless you give it to them. Compatible with PC & Mac computers—no drivers needed. Works with Windows 8, Windows 8.1, Windows 10 and Mac OS 10.6+. 3-year limited warranty6. See www.sandisk.com/extreme-900 for compatible systems or contact your host device manufacturer. 1. 1TB=1,000,000,000,000bytes . 1GB=1,000,000,000 bytes. Actual user storage less. 2. As compared to 500GB portable hard drive based on internal speed performance tests. 3. Password protection uses 128-bit AES encryption and is supported by Mac OS X v10.6+, Windows Vista®, Windows® 7 and Windows 8.